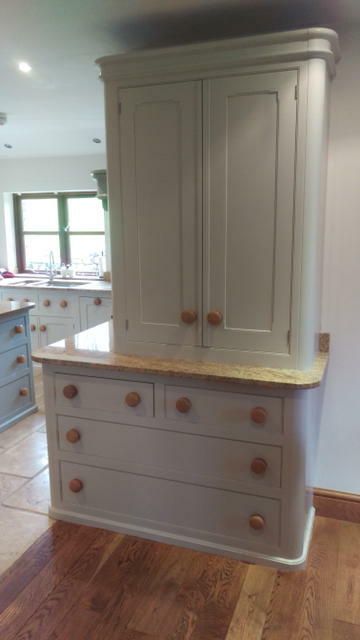 You simply can not just paint a kitchen with any old paint as someone has spent a lot of money, time and effort in buying it. Have a look at this Smallbone kitchen in the same village we did. 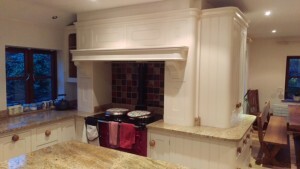 I was contacted in the first instance from a couple who had their Mark Wilkinson kitchen fitted around 12 years before. It was in much need of a re paint. The odd dent as well as the odd kitchen knob loose and generally it looked tired. 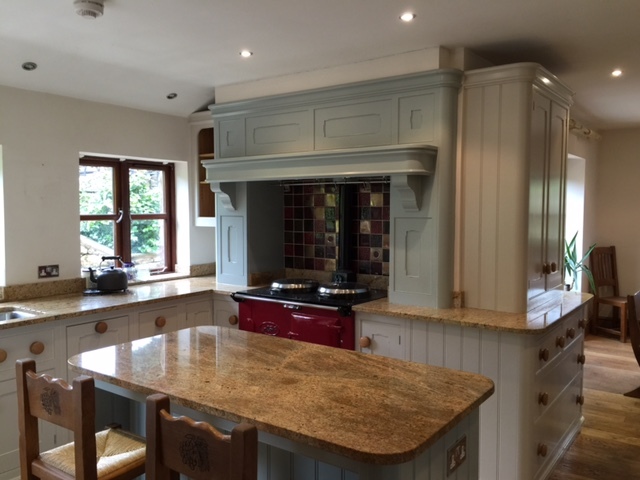 We had been recommended by their good friend and builder who knew we had a good name as kitchen & furniture painters. I was asked to call round and price it all up, luckily it was only a few miles away in Chipping Lancashire. On looking at the finish and seeing it for the first time it was definitely in need of a makeover. A count up and a good look at what it needed I was able to provide there and then. Which I left with them. 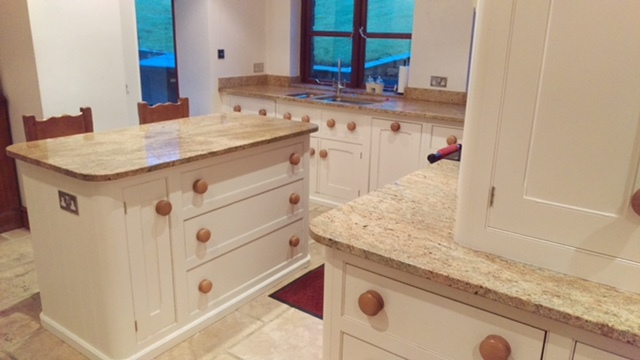 I also had a look at possible colours that would go with the granite to really give the kitchen a different look. Thankfully a few days passed and I was given the good news that we were asked to re painted the kitchen, so it was booked in with the deposit paid, color confirmed. The job itself was not a lot different to all the others we do but for all the screws they use to fit them, 15 screws on a single drawer front. The usual degreasers were used to degrease and clean it all after thorough protection of all the surfaces. Once all the surfaces are clean and dry it was given a complete sand down. 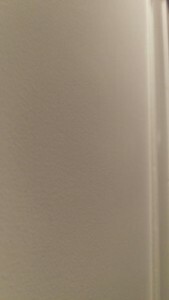 This removes any roller peel and brush marks left by the previous painter to a marble like finish. Sanding out of the way. With all of the sanding out of the the way using the latest in dustless sanders and the kitchen now dismantled it looked bare. 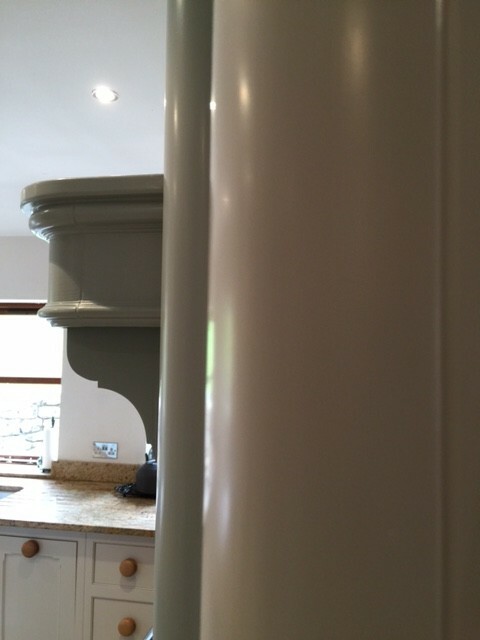 The chosen primer was an oil grip primer from Tikkurila. A fabulous primer that is self leveling, this also leaves a brush free finish and a perfect base coat. Priming took around three days as it was rather a lot of work. But it was now starting to change colour. So at this stage you get to see what the colours are going to look like. 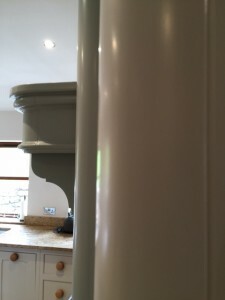 For the top coat we used another Tikkurila product. This time a hard wearing waterborne paint. 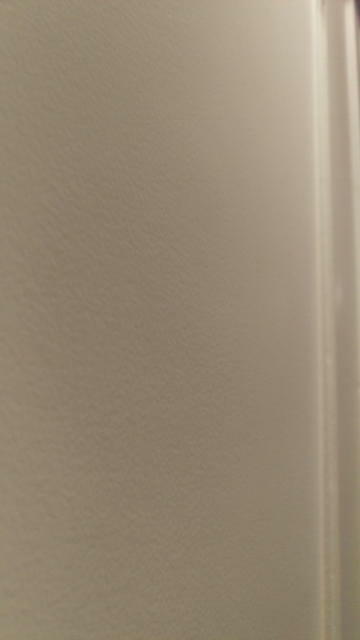 This dries to a beautiful eggshell finish and flawless. With the kitchen all painted and dry it took us 14 hours to re assemble the doors and drawers. A truly well put together kitchen. This was a fabulous kitchen to undertake and one that now looks like it should. It looks like it just came out of their showroom in Cheshire. We are a founder member of the HPKUK team of the very best independant kitchen and furniture in the UK. Thanks for taking the time to read this blog. JS Decor are the first port of call. From South Lakes to South Cheshire, Merseyside.